A modem used to connect a computer to a cable TV service that provides Internet access. Cable modems can dramatically increase the bandwidth between the user's computer and the Internet service provider. Download speeds have reached 6 Mbps and beyond, but the connection is asynchronous. In order to prevent users with lower-cost cable access from hosting high-traffic Web servers, the upload speed is considerably slower, from 10 to 20 times slower. Cable operators also routinely change IP addresses assigned to users to prevent Web hosting . Cable modems connect to the computer via an Ethernet port, which is an always-on connection. Ethernet is a shared medium, and the individual user's speed will vary depending on how many customers are sending or receiving data on that cable segment at the same time. For example, when the kids come home from school around 3pm, many cable users experience a corresponding slowdown. See DOCSIS, cable Internet, Internet appliance and MSN TV. A cable modem is a special type of modem that is designed to modulate a data signal over cable television infrastructure. Cable modems are primarily used to deliver broadband Internet access, taking advantage of unused bandwidth on a cable television network. There were 22.5 million cable modem users in the United States during Q1 2005. That's up from 17.4 million in Q1 2004. It is also commonly found in Canada and Latin America. Cable modems allow s consumers access to the Internet at higher speeds and at a fraction of the time it takes traditional telephone modems. • The service is "always on," meaning customers get the information they want, when they want it. Unlike telephone modems, cable modems allow consumers to keep their telephone lines open for voice conversations. A CATV network is designed and used for cable TV distribution. With an upgrade of the system, it is normally possible to allow signals to flow in both directions. Higher frequencies flow toward the subscriber and the lower frequencies go in the other direction. This is done by upgrades to the amplifiers in the cable distribution network etc. 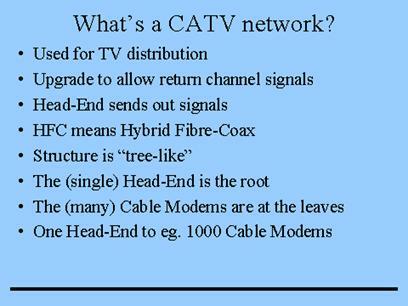 Most CATV networks are Hybrid Fiber-Coax (HFC) networks. The signals run in fiber-optical cables from the Head-End center to locations near the subscriber. At that point the signal is converted to coaxial cables, that run to the subscriber premises. One CMTS will normally drive about 1-2000 simultaneous Cable Modem users on a single TV channel. If more Cable Modems are required, the number of TV channels are increased by adding more channels to the CMTS. A number of different Cable Modem configurations are possible. These three configurations are the main products we see now. Over time more systems will arrive. The external Cable Modem is the small external box that connect to your computer normally through an ordinary Ethernet connection. You will need to add a (cheap) Ethernet card to your computer before you can connect the Cable Modem. A plus is that you can connect more computers to the Ethernet. 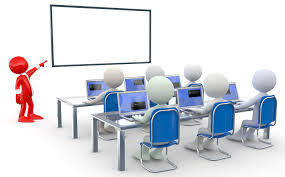 Also the Cable Modem works with most operating systems and hardware platforms, including Mac, UNIX, laptop computers etc. Another interface for external Cable Modems is USB, which has the advantage of installing much faster (something that matters, because the cable operators are normally sending technicians out to install each and every Cable Modem). The downside is that you can only connect one PC to a USB based Cable Modem. The internal Cable Modem is typically a PCI bus add-in card for a PC. That might be the cheapest implementation possible, but it has a number of drawbacks. First problem is that it can only be used in desktop PC's. Mac's and laptops are possible, but require a different design. Second problem is that the cable connector is not galvanic isolated from AC mains. This may pose a problem in some CATV networks, requiring a more expensive upgrade of the network installations. Some countries and/or CATV networks may not be able to use internal cable modems at all for technical and/or regulatory reasons. The interactive set-top box is really a cable modem in disguise. The primary function of the set-top box is to provide more TV channels on the same limited number of frequencies. This is possible with the use of digital television encoding (DVB). An interactive set-top box provides a return channel - often through the ordinary plain old telephone system (POTS) - that allows the user access to web-browsing, email etc. directly on the TV screen.